...Or get started right NOW! Thank You, for your message. We will reply to you soon. I agree that my information will be saved in order for WiseTeam to contact me about the demo version and provide offers for any other products or services. WiseTeam system covers all functions that are needed to manage professional services’ companies: from finding potential clients to billing and invoicing. WiseTeam system enables organisations to manage their internal project portfolio, to organise team’s activities, delegate tasks easily, and to monitor employees’ workload and efficiency. WiseTeam system enables effective project management, when many remote stakeholders participate in the project and real-time information is needed. 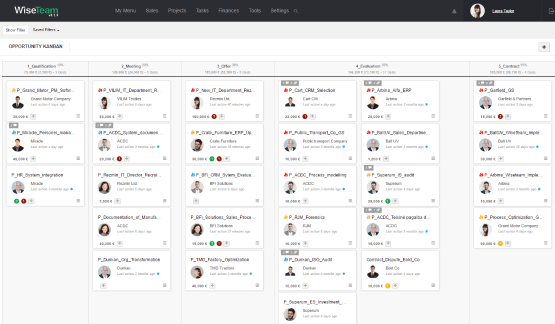 All tasks related to projects, sales and internal activities are planned in one place and monitored in real-time. 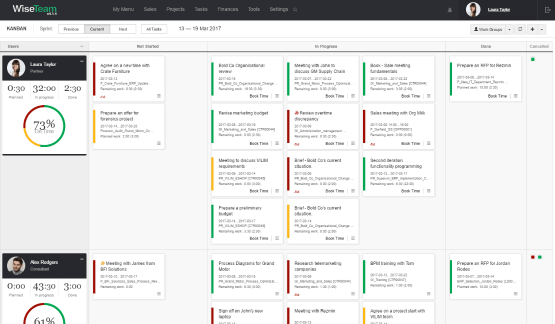 Tasks are displayed on an interactive KANBAN board. It allows to delegate tasks easily, focus on tasks of the week and always see employees’ future workload. Employees’ time is tracked with little effort, every project has summary information and billing is very simple. Plan a project, its activities, results and budget easily. From now on you can monitor project’s status in real-time and can deliver the results on time, within scope and budget. Monitor not only one project, but whole project portfolio or all company’s projects. Storing information on potential clients and their employees in one place enables you to keep track of your sales opportunities. You can analyse sales potential in a sales funnel and can estimate the number of sales opportunities in every stage. The tool also provides segmentation of your potential and current clients, you can organise marketing campaigns and monitor the efficiency of their implementation. WiseTeam solution is developed with a responsive user interface, which adapts to the size of used device, so you can use it on a tablet or a smart phone. 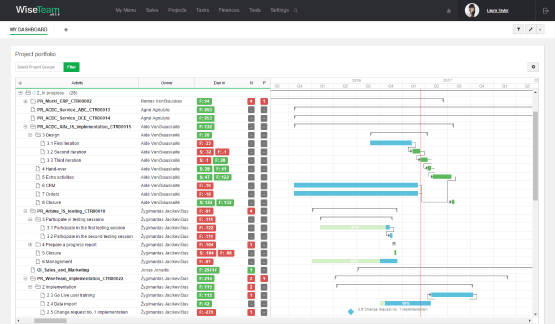 Tools for analysis are flexible enabling every employee to create their own dashboard with analysis tools most important to them.